Cladun X2 is a dungeon crawler game made by Nippon Ichi Software, a company I know for weird games with sometimes interesting concepts, I'm always interested in games with strong meta mechanics and pixel art so I gave it a go and it's a very interesting game, one that I'm not going to finish because of save file loss, but interesting nonetheless. CX2 is an action RPG where you walk around dungeons trying to find the exit - which often means you defeat monsters and collect items from chests, and gold. There are a few weapon types all of which have their own special abilities and associated skills such as swords, maces, daggers, staves, spears and bows. You attack using one button and can charge-up some attacks, you can use some skills by spending SP, you can dash, jump and talk, pretty standard. If you attack enemies from the sides or the back, you might deal more critical hits and some enemies and invincible except if hit from behind. 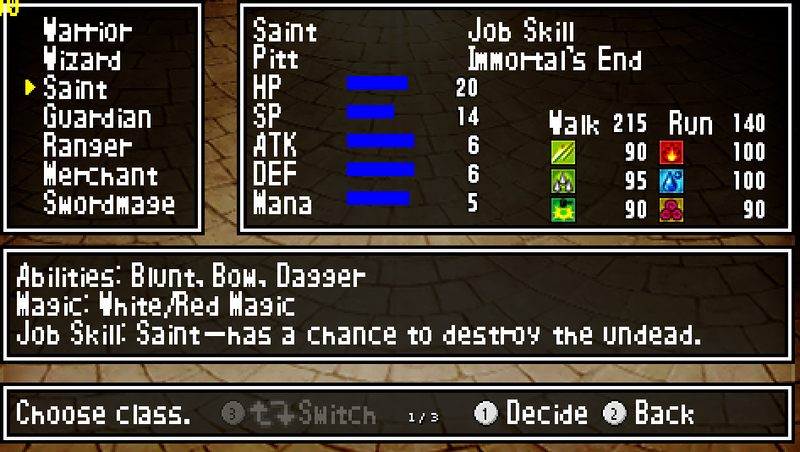 You also share a big part of your HP with other characters - you can see that in the upper right of the screenshot - so they take damage for you before your main character starts to lose health, which means you're going to create multiple characters and link them together using magic circles. Basically, they are board-game-like things where you place characters and items to strengthen your 'main' character who's going to go fight in dungeons. So you create more characters and level them up also so they give better bonuses when you go forward with your main character and if you try to make different classes with all of your characters and use different weapons, they're not going to play exactly the same and it's good variety. Even after playing a dozen of hours there are still mechanics I don't understand in the game, everything which could be fixed with better tutorials or help menus. Telling me what SP Debt is would be nice, or what these icons mean in the equipment screen - it's hard to figure out which armor is the best for me - or even telling me everything I can do in the game, I didn't figure out that 'item titles' were modifiers such as +1 attack or + 1 defense, I thought they only were names affixed to items. Apparently you can move them around and transfer them to other items. Or 'fame' which increases when you beat levels really fast, or about half of the items that I can use in the magic circle board thing. 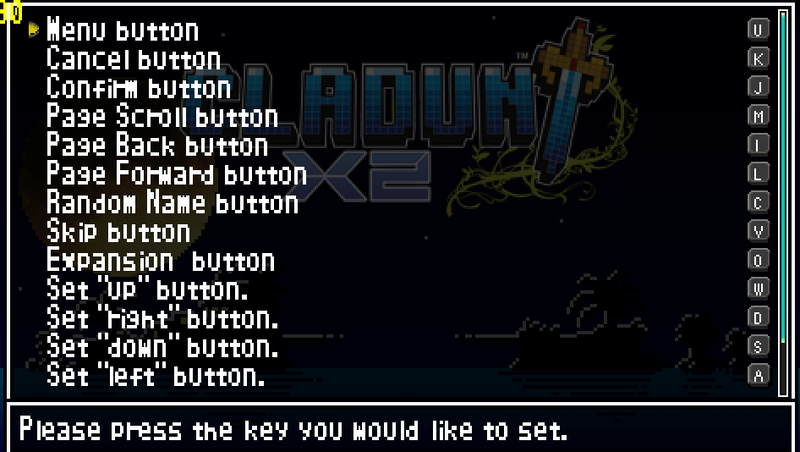 Another thing that was really hard is playing this game with a keyboard because you have way too many keys set to different things, there's even a sub-menu for key used inside of dungeons such as jumping and attacking and they can overlap with other keys and it creates weird situations where you can't even open the menu to change your keys. Identify things better, explain what you can and can't do with the various systems of the game and it will go a long way in helping me understand what the game thinks I should've been doing. For the keyboard thing, maybe have less key bindings or clearer, more contextualized ones. I have tried all available classes and I love ranged classes the most but some enemies are really resistant to ranged weaponry. Melee is okay too but parts of the game are frustrating when you're trying to hit enemies and need to inch away at them until you can hit them but they can't counterattack, when you're fighting ranged enemies with easily predictable patterns or when you need to move in for a few hits then run away again. Movement feels a bit stiff and you need to be very precise at times, since this is a 2d pixel-based games, precision isn't going to be easy with analog controls. It's also hard sometimes to get a good sense on your actual range and if your weapon is going to hit. Which is annoying, but you get used to it after a while. SP also doesn't regenerate, you need to pick up orbs to recover it, so use them wisely! Or get SP Debt, whatever that is. Make the movement a little bit more snappy, being able to move and react a little bit quicker could go a long way, also adding some kinds of range markers for some attacks wouldn't hurt, especially for enemies that periodically hit everything around them or shoot at fixed intervals - maybe a way for these enemies to show off they're going to attack early enough that you can dodge the hits? You can do tons of little custom things in CDX2 such as editing your character's sprite, any of your weapon/armor, you can edit the background music and setup silly character 'links' between them to fool around. I didn't do much of it because it takes some time to make good sprites/music and there's no point to. I did some character "linking" but it's random nonsense, albeit a little funny. I just wasn't ready to invest any time drawing sprite art or learning this game's music system. Add some reward for deeply customizing your character, if you edit your face, for example, you can get a bonus to maximum SP! If you edit the music of the level you're going in, maybe you get some boost to movement speed! Editing weapons might increase their strength and linking characters could give them some bonuses when you place them in magic circles.